Your employee can keep track of hours on a weekly basis. The weekly view is a convenient way to enter time on a weekly basis. 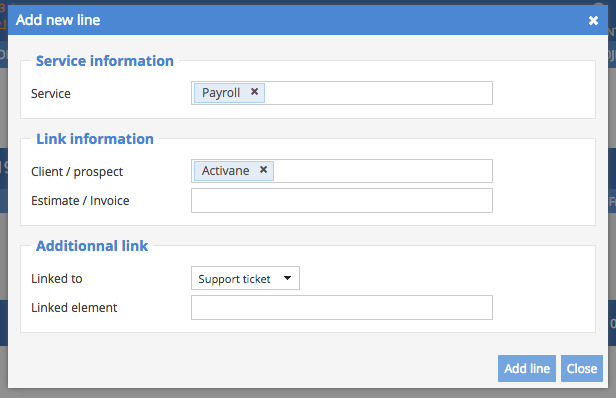 To access it, click Time tracking, and then click Timesheet. The input window will be displayed with the current week (you can navigate betweens different weeks with the arrows). To add a start time click Add line. Then you can enter a customer, a paper, and choose the service. The weekly line display. Now, add hours sold in boxes solely for your activity. Click Save, and you're done. Chosen combination already has separate inputs (created elsewhere in Sellsy). Sellsy can not accept the cumulative input: do a quick entry instead. Time was already billed. In the same way, choose to create a quick entry.